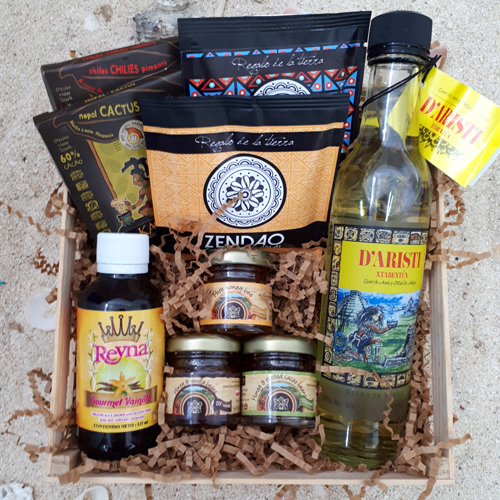 Flavors of Mexico fill this gift-wrapped basket. A 1 oz single-serve bag of both Chiapas Zendao Cafè Artesanal Coffee and Oaxaca Organic, sample 1 oz jars of Mexican Pure Honey, Honey with Vanilla, and Honey with Cocoa, 125 ml of Mexican Vanilla, 30 gr bars of both Chocolate with Nopal and Chocolate with Chili from Kaokao Chocolates, and a 250 ml bottle of Xtabentùn, the traditional Mayan liqueur. You’ll be nuts for this coconut inspired gift basket. 5 oz of Dulce Coco handmade soap and a 4 oz handmade Dulce Coco soy candle provide the coconut aroma. 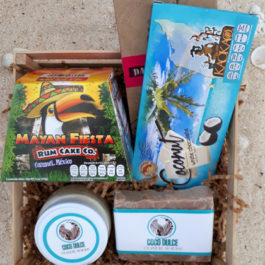 A Coconut Rum Cake from Mayan Fiesta Rumcakes, and a 100 gr bar of both White Chocolate with Coconut and Dark Chocolate with Coconut from Kaokao Chocolate lend a delicious coconut flavor. A gift-wrapped basket with 8 oz of our Chiapas Zendao Cafè Artesanal coffee, a medium roast mixture from Chiapas, Oaxaca, and Veracruz. 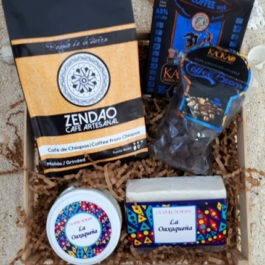 Also included is a is a 30 gr bar of Chocolate with Coffee and a package of Chocolate covered Coffee Beans from Kaokao Chocolates to offer sweet coffee treats. A 5 oz bar of La Oaxaqueña deodorizing, handmade coffee soap, as well as a 4 oz coffee-scented candle provide that delicious coffee scent for coffee lovers. The basics for a sunny day at the beach. 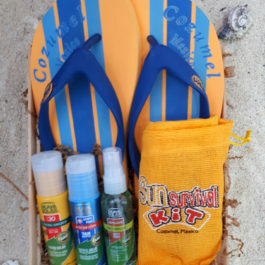 Men’s Flip Flops and a burlap Sun Survival Kit filled with 75ml Sun Block, 75ml After Sun Cream, and 60ml Insect Spray. All the Maya Solar products included are hypoallergenic and biodegradable – safe for the flora and fauna in our Cozumel environment. 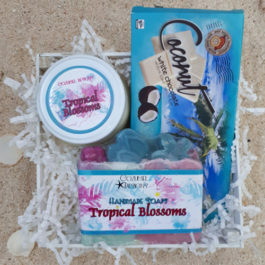 A 5 oz Tropical Blossom handmade soap and a 4 oz Tropical Blossom handmade soy candle fill the basket with the fresh scent of tropical flowers. And the big 100 gr bar of White Chocolate with Coconut make this gift a real delight.